The 2011 album ‘Every Knee Shall Bow’ was my first introduction to Nyodene D, and based on the quality of that album, I had high expectations for what would be delivered with their Malignant Records debut. So, from the get go ‘Edenfall’ does not disappoint and actually manages to build on every aspect which made ‘Every Knee Shall Bow’ great. The major aspect of this is down to the production, which has been mastered with loudness and clarity. Effectively the multitude of noise elements / layers are clearly audible and individually discernible, allowing ‘Edenfall’ to deliver a heavy sonic punch in the power electronics / death industrial arena. The title track introduces the album and kicks in with full force: rough crunching noise, loose static riddled loops and overloaded feedback, later introducing distorted synth squalls to amp up the atmosphere. Likewise as the vocals arrive to drive home their message, their slight difference in presentation is immediately evident. Whilst similar in delivery and style, vocals here are drenched in distortion, meaning a greater degree of concentration is required to pick up what is being said (…or if that is too difficult, full lyrics are printed in the cover). Second track ‘Damnatio Memoriae’ is up next and presents a straight down the line PE attack, reminding somewhat of Ex.Order, being built on looped wailing / drilling noise elements, and heavily treated harsh vocals – delivered courtesy of another PE project Shift. Alternately ‘Anasazai’ is a little less bludgeoning, being melancholic in tone and consisting of a more sparse death industrial noise framework, with looped tribal / ritual type vocal sample and junk metal clatter to good effect. Partly reminiscent of early to mid era Brighter Death Now, ‘Nihilation’ drives forward with its nauseous loops and roaring noise – although the vocals very much place a clear Nyodene D stamp on the piece. Rounding out the album ‘Borne on Vultures Beak, I Am Carried Into The Heavens’ takes a tense droning approach to its PE sound, which may be due to the sound source credited to Sky Burial (…with the track title also seemingly paying homage to this contributing project). With a sustained background textures (…treated orchestral strings perhaps?!) and cavernous echoed loops, the immense flanged and distortion tinged vocals reign prominently up front within the mix. Fantastic. Apart from the excellence of the music, the artwork is worthy of a mention, which is suitably slick in appearance, where the chosen images are cleverly utilized to imply the album’s title theme. 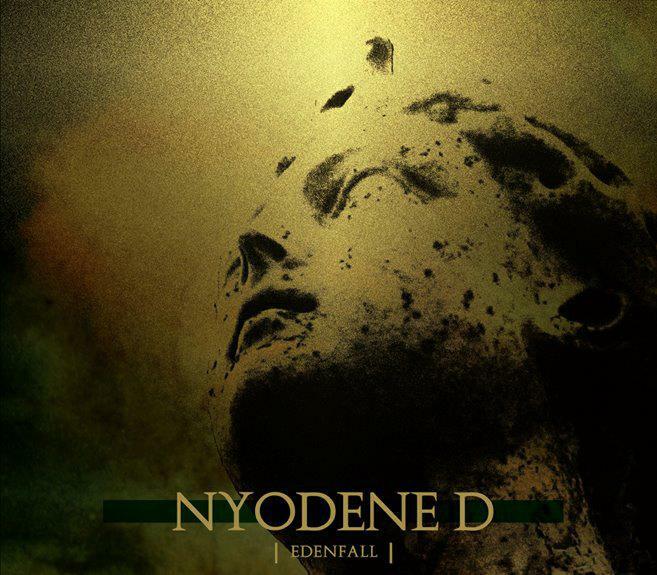 To conclude there is not much else to say other that ‘Edenfall’ is easily a pinnacle release of 2012 and highlights the current supremacy of Nyodene D and more broadly the American PE scene. This entry was posted in 2012, death industrial, heavy electronics, Malignant Records, power electronics by noisereceptor. Bookmark the permalink.